Sneakeasy is a 26 foot Phil Bolger "power sharpie", a simple flat-bottomed craft (at least in it's initial conception), which Phil advances as a very efficient power boat, but which also retains essential elements of the period elegance of some early 20th century speedboats. Sneakeasy is a plywood boat of simple "instant" construction, designed to be an extremely efficient, low-powered, low wake cruiser. She's one of the series of Bolger "power sharpies", the original of which (Tennessee) was closely related to Albert Hickman's "Viper" of 1910. The original Viper attained 18 knots from her 12 hp engine, a truly remarkable feat especially for that time. Sneakeasy is designed for 7.5 to 20 hp. This page is an attempt to organize the some of the scattered material about this remarkable craft. Sneakeasy exists in two different incarnations (see examples below). 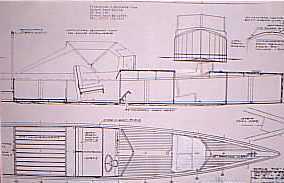 Plans for the original flat-bottomed version can be ordered from Harold H. Payson & Co.. Bolger also modified Sneakeasy to incorporate his "step chine" design in order to better handle running in heavier seas and improve higher speed banking in turns. This design is described in Bolger's book "Boats with an Open Mind", available from International Marine Publishing. My son loves to ride up forward in boats, so I wrote Phil about his mention of a front cockpit for Sneakeasy in "BWAOM". This is the rough sketch he sent back. He understandably cautions against passengers riding up there in rough weather - too much weight forward. Launch and Construction Photos of my Sneakeasy (6/20/99 Launch Day!!!!!!!! Gregg Carlson's Step Chine Sneakeasy - great step-by-step construction photos! Mark's Sneakeasy , with no windshield. (formerly associated with Toucan Canvas, but now www.toucannet.com/boat.htm is a dead link - anybody know the whereabouts of this boat?). The link here is to the Internet Archive Wayback Machine cache of the web page from 1999. Steve Bosquette has just launched a really nice one, - in South Portland, Maine. Jeff Blunck is currently building a Wyoming and has great pictures of the Australion "Wyo" linked on his website. Dakota (38 ft), "Prefabricated River Cruiser", written up in Bolger's column in the August 15, 1995 issue of "Messing About in Boats". One Dakota is currently under construction by Vince Chew in northern Michigan. A Tennessee lives in the Florida Keys, the Mangrove Mistress , where her owner uses her for ecotourism charters.